We have been in serious need of a new scale for a while. Our old scale got to the point where it was giving us a different weight every time we stepped on it, even if it was three seconds apart. If you stepped on and didn't like your weight, you could just get off and on a couple times until you felt better about the number that appeared. It was handy trick for feeling better after a bad day, but not really helpful or accurate when it came to trying to lose weight. But now our days of inaccurate results are gone because we have a Withings Smart Body Scale in the bathroom. Doesn't it look like a regular digital scale? It may look like one, but this shiny scale has a lot of fancy features hiding inside. First, it doesn't just give you your weight, but it measures your fat and muscle percentage as well. Plus, it makes sure you are centered on the scale for an accurate reading and will tell you, with little arrows, if you need to move in a certain direction. But the best feature is that it will automatically send all of this information to your online account that you can view on your computer, iPhone, iPad, or Android. After we set it up, my husband couldn't figure out what we had to do to keep track of individual users. The reason he couldn't figure it out is because you do not have to do anything. The scale automatically recognizes who is using it and stores the information for up to eight users. And if you don't want other people on your account to be able to view your results, you can set up privacy features to make sure your kids aren't telling their friends how much you weigh. If you do want to share the information, you can set it up to send it to your doctor, your personal trainer, or even post it on Facebook and Twitter. That last one is a feature I will NOT be using. You can also share the information with other programs. I have started using RunKeeper to track my 5K training and it takes the information that the Withings Smart Body Scale gathers and uses it to more accurately determine how many calories I am burning during my workout. There are dozens of other compatible services to help monitor your weightless and fitness goals and because the scale measures your muscle mass and fat mass, you can see the impact of your efforts as a complete picture, not just a number on a scale. It helps keep you motivated when you see those numbers change. You can also set goals and receive weekly progress reports to keep you on track. If you have made any sort of health related resolution this year, you are going to want this scale. So Best Buy is giving one away to one of my readers. Leave me a comment letting me know how you would use the Withings Smart Body Scale to monitor your health this year to be entered for a chance to win. Rules: No duplicate comments. You may receive (2) total entries by selecting from the following entry methods: a) Leave a comment in response to the sweepstakes prompt on this post b) Tweet about this promotion and leave the URL to that tweet in a comment on this post c) Blog about this promotion and leave the URL to that post in a comment on this post d) For those with no Twitter or blog, read the official rules to learn about an alternate form of entry. This giveaway is open to US Residents age 18 or older. Winners will be selected via random draw, and will be notified by e-mail. You have 72 hours to get back to me, otherwise a new winner will be selected. The Official Rules are available here. This sweepstakes runs from 1/18 - 1/24. Be sure to visit the Promotions & Prizes page on BlogHer.com where you can read other bloggers' reviews and find more chances to win! Also be sure to visit the Inspiration to Fitness page on BlogHer.com where you can read other bloggers' reviews, get great fitness tips and find more chances to win! You can also roll over the Best Buy image at the top of my blog to view a calendar of all the Inspiration to Fitness content. Good luck! Disclosure - This is a compensated review from BlogHer and BestBuy. 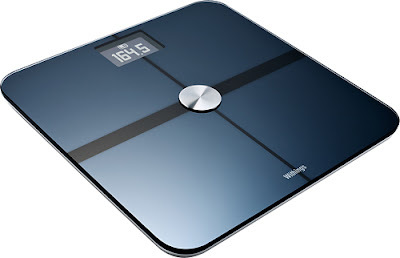 I received the Withings Smart Body Scale to use for the purpose of this review. All opinions shared are my own. Best Buy does not sponsor, endorse, approve, or have any responsibility for this promotion. ooooo...this would be SO helpful!! I am trying to lose weight as well and my scale if so ridiculously not accurate...this scale sounds wonderful! I would be way to excited to win this!! YAY! Thanks for the hosting the giveaway! This would be super helpful. Trying to lose 10-15 lbs right now and the more accurate my numbers, the more motivated I'll be! Coolest scale ever. I love that it tells you more than just how much you weigh! I would love to have an easy way to track both weight and BMI. Eating while reading about a cool scale and fitness goals makes the meal more redeemable, right? Thanks for the chance! I would use this scale to measure my weight and work with my 15k RunKeeper training goal! I also posted about this giveaway on Twitter! I love this scale! I'm trying to lose the weight from the new baby and this scale would be super helpful! Thanks for the chance! I would love to win this scale! I just started a new fitness routine, and am hoping to move toward a healthier weight - closer to my goal weight. I just want to be a healthier me! And this scale looks a-MAZ-ing!! My BF and I are on a weightloss journey and have lost 50 lb each and would like to shed another 30. We changed our whole lifestyle in order to achieve results, including weekly weigh ins on Sunday mornings, jogging after work, and planning meals that roughly fit into weight watcher guidelines. This scale would definitely help us get to our goal! I'm 'training' for a 5k right now...plus just trying to get in better shape. It would be so much easier and convenient to be able to see BMI etc right there at my fingertips..or toes. This scale is amazing. I've never owned a scale but it is due time for one! I would LOVE to win this and keep up with my weight and also to be able to keep track of my kid's weights would be great! Wow. Now that's a scale. I love the fact that it can track your progress not only for yourself, but for multiple people as well. My husband is trying to eat healthier and exercise so he would LOVE this. I think this would really motivate him since he is a totally techie. Oh, that scale sounds so awesome! I need a new one bc mine does the same thing as yours!! I really need to get back to my diet and lose the last 10 lbs I'm carrying around. So, this is pretty much the coolest thing I have ever seen! I love the fact that it stores multiple profiles and that it's technologically interactive. I think that my family would be able to use this and add in some healthy competition between my husband and I. Don't 'they' say something about the couple that sweats together...? Because of a recent health scare, I need to get healthy. Not just loose weight, but change myself. This would be an awesome tool to help me do just that! This looks awesome! I've never seen anything like it! I'm not sure this is a good idea or not. :) But we need a scale and a free scale would be awesome!! (I don't think I'd be seeing a 120 in the screen...but it would be cool to have a smart scale! Thanks for a great give-away! I'd love to use this to help me shed some baby pounds...especially now that my baby is 16 months old!! what an awesome scale. I really want to lose the 30 lbs that just wont seem to go away. How cool that it will work with your smartfone. I love the scale. Thanks for the chance to enter. We need this scale! We just started a weight loss program because we have a cruise scheduled for March. Must shed those extra pounds! We are motivated! Thanks! My husband is not feeling at home in his body and has decided to make some changes (read: he still looks great to me, but he gets to be the decider for himself.) This scale would be great for him. I may have to run and get him one for his birthday. I so need a new scale! I've been eying this scale on LoseIt.com. The app has helped me lose a few lbs. Would love to win this! This looks like tons of fun - weightloss fun? yea i said it! So i lost about 30 lbs last year an maintained it but my goal this year is to build some serious lean muscle! Watching those numbers would be fun to see the change in body fat - funny that i thought a smart device like this must exist somewhere! Finger's are crossed! This would be great! So much to keep track of in this life and this scale does it for you. Wonderful! I would love to win this! I am getting in shape learning yoga, rock climbing, and running. I NEED this awesome scale! I just had a baby and am working my way down the ONE HUNDRED pounds my doctor said I should lose to be super healthy. I'm on the treadmill 6 days a week and it would be cool to see the weight loss in charts and graphs on my computer. I just had my fifth surgery in 8 months and they have had what we'll call a less than ideal impact on my ability to exercise and even eat right. I'm getting married in March and need some serious help keeping track of my weight, goals, and body fat composition. The doctor cleared me to work out starting next week so I'll be working very hard in the very near future! My husband and I have been trying to get down to a healthy weight. We have both lost over 30 pounds each but still need to lose more. The scale we have always gives a different number so we just stopped using it. This would be great to win! this looks like a great tool to help me achieve my healthy living goals! I'd so love to try it! wow that looks like a great addition to my goal to lose weight. It would help me with my weight watcher progress, because my scale is not very accurate. Our scale is old and I just don't trust it. 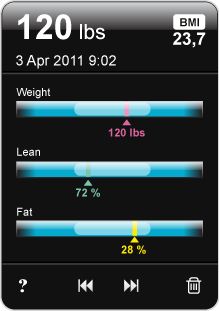 This scale seems like it is a very useful tool in weight loss as well as maintaining weight. Thanks! I don't own a scale. Never have. I think it would be helpful in helping me achieve my weight loss goals this year. I would love to win this...I have been trying so hard to lose weight and I would really benefit from this scale. I could link it up to my loseit account! Thanks for the giveaway!